Muti is not my go-to guy for Mozart. Several years ago I bought his version of Cosi Fan Tutti on EMI. I feel it is underrated and enjoyed it and the terrific singing a good deal. I encountered this Figaro set second hand on Amazon for £5.50 including post. It arrived with its 318 page booklet. The draw for me was the cast. Over the years Mozart operas have been very fortunate with a number of mouthwatering sets including Solti’s which I regard as one of his most idiomatic sets, really beautiful. There is Giulini also, always there casting a shadow and amongst others that I own there is the Currentiz, which I regard as too hard driven and badly handicapped by a certain singer. The Muti is fast, but he allows plenty of space where appropriate. The pacing is sensible, slower in the arias than the HIP performances, but faster than old Bohm school, natural, lyrical, often tender. He generates a tension where needed, the last act is very well paced in a great arc. All the singing is first rate. Battle’s voice is a good counterpoint to Price, each sing beautifully and there is no mistaking which is which. The men are less clearly differentiated, but are excellent and sing with face. A litmus paper test for me is whether the final reconciliation gives the impression of suspending time, it does, how could it not with Price spinning the sinuous line given to her?. Any performance that muffs this passage has substantially failed overall. This encouraged me to look for the Don Giovanni by Muti. No way do I need yet another, but at £2.70 including post, why not? I spent about £30 on a seat for a none to thrilling concert yesterday. So, I encounter these absurd bargains and don’t hesitate. There is a well priced boxed set of the three da Ponte operas by Muti available....if anyone is interested. 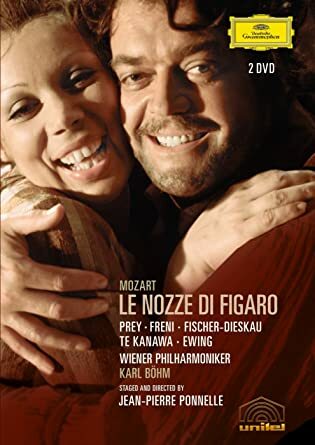 The Figaro I ended up loving the most was Ponelle’s film for Harnoncourt. Fischer Dieskau is so very funny! It’s not so much the impression of time standing still in the garden scene which counts for me, it’s a moving, humane, believable reconciliation of count and countess. Ah I thought this was gonna be more about the operas themselves rather than great recordings and reviews of the operas. But would it be alright to use this as a general thread? Because I do have questions about them! I would very much be interested in broadening my knowledge of the operas, how they were composed and where they were premiered, the forms and styles used in each one of them, but I'm not familiar with most of the operas. Ones I know: Don Giovanni, Le Nozze di Figaro, Die Zauberflöte. How was Mozart's handling of opera seria? How much of the da capo form was retained and at what point, if any, did new forms evolve from the da capo aria? What sort of themes are explored in his most well known opera seria? That would be Idomeneo. I don't know by heart how many of the arias are dacapo. The piece is fairly dramatic and very worth your while. Note also that among his late operas Mozart brings opera seria elements into the opera buffa and Singspiel respectively. The huge "Martern"-Aria from the Abduction is pure opera seria, so are the arias of the Queen of Night in Zauberflöte and Donna Anna in Don Giovanni as well as the countess in Figaro are, to an extent, opera seria figures. Mozart's penultimate opera was also an opera seria - La Clemenza di Tito. It has a moth-eaten libretto that had been set numerous times before, the theme of the opera is the benevolence of the ruler - Tito pardons his would-be assassins. The rest of it is the usual opera seria stuff - A wants to marry B but B is secretly in love with C, D thinks she should marry A meanwhile E is in love with D etc etc etc. Miraculously, Mozart managed to breathe life into this tired old rubbish and wrote some beautiful music. The most celebrated aria is the rondo for Vitellia 'Non piu di fiori'. For a time, after Mozart's death Tito was his most popular opera and fairly widely performed despite being in a now practically obsolete genre. It's been a long time since I last listened to and dived into Mozart opera stuff, but his development in composing them, either being buffa or seria, is quite fascinating iirc. Most of his many youth operas are traditional operae seria. And there are a lot of them. La Clemenza di Tito, his last one, is quite revolutionary, because it broke from the usual seria model (and the original libretto, which was also shortened) in eliminating the da capo arias and adding ensemble scenes and large modern arias. Idomeneo is more traditional in its entire length, but it also already lacked the life long aria's with lots of ornamentation. There's much more to say... but... maybe later (shortage of time right now). That was Karl Bohm, wasn't it? A classic, at any rate. Yes there’s a fabulous bit where Figaro is trying to outwit him about Cherubino etc, and the count knows there’s something fishy going on, and yet can’t quite get to the bottom of it, Fischer Dieskau is a wonderful aristocratic buffoon at that point, memorably funny. The music Mozart writes for that scene is very very good!